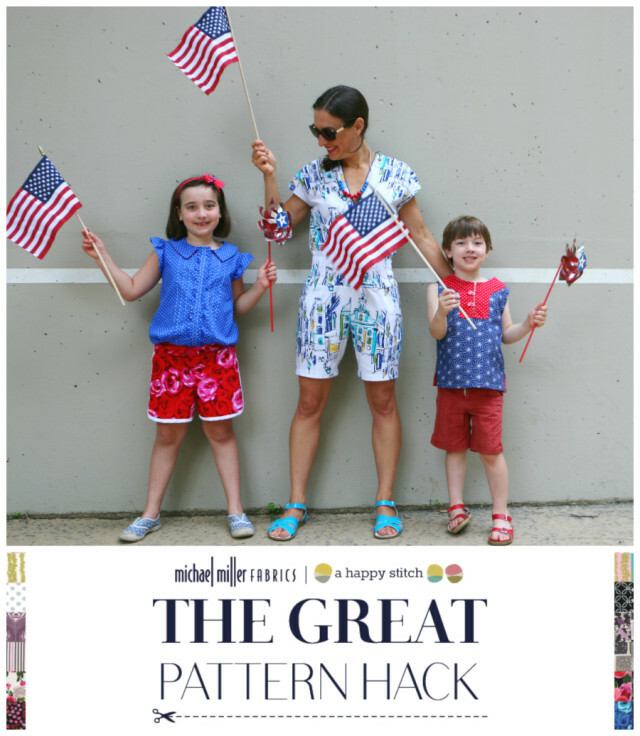 There is something for just about everyone in today’s Great Pattern Hack! Seriously. Jane from Buzzmills joins us and her seemingly endless amount of energy has translated into THREE pattern hacks! She outfitted her family in Fourth of July garb by transforming a Charlie tunic from Made by Rae for her son in Indigo fabric collection; hacking a Burdastyle short-sleeve jumpsuit in On The Town fabric; and romper-izing a Josephine Dress from Violette Threads in On the Town! She goes through, in detail, on her blog so do not miss it. Feeling inspired yet? Getting hacking! Join in by grabbing some Michael Miller fabric and showing us your skills! Hack a pattern, any pattern, and share your creation on Facebook, Twitter or Instagram. Make sure to tag your photos so we can find you– @michaelmillerfabrics and @ahappystitch and use the hashtags #GreatPatternHack #MichaelMillerFabrics #AHappyStitch . It’s been so fun to see your creations so far! Keep ’em coming. Wondering if you won 5 yards of fabric in the flash giveaway? You can enter until noon today! Watch for a winner at 4pm EST. Ha Ha Ha it’s a flag family.